MyColourGlass offer glass worktops for your kitchen or bathroom. Glass worktops are all the rage and also very functional for the ultimate in styling. Worktops, whether they be in your kitchen or some other area of your home, look especially nice when paired up with glass wall cladding. Many businesses are going for glass worktops as part of their overall environment. You can’t beat these when it comes to cleanliness and beautiful durability. Yes, you can have it all when it comes to using glass work in your decor. What Are Some Of the Features and Choices in “Glass Worktops” From MyColourGlass? Glass worktops are serious business at MyColourGlass when it comes to beauty and functionality combined as one. Let’s look at some of the offerings. If you have any questions at all, feel free to ask out experts and they will assist you promptly. Infinite Colour Choices and Colour Matching- Any colour you can dream of or choose can be selected for your glass worktop. Many like to match their worktop to their splashback, or other colours of their palette. If you are having difficulty in choosing the colour or colours that best compliment your total surroundings, ask the specialists at MyColourGlass (as mentioned before) and they will be sure to assist you in making a final selection. We have a RAL Colour Chart for your convenience. We can also match practically any colour sample you bring us. This is a big time in your life with total changes which are really going to be a definite update. It has been said that you can never have too much glass work in your kitchen area or bathroom. Glass worktops are also making their way into commercial settings for the most contemporary in decor and usage. Durable Toughened Glass Worktops Come In A Variety of Thicknesses- The MyColourGlass specialty work crew offer you the best in choices for the standard glass worktop you will need. We are quick to point out the best thickness for your use. Some uses require more durability than others. Often times, certain looks are wanting to be achieved, and the thickness of the glass is important for that particular look. Our “well seasoned” glass installers and workers will make sure that all is exactly as you desire. Our worktop glass comes in four sizes ranging from 10, 12, 15, and on to our thickest at 19 mm. Precision Cut to Fit Most Any Space or Area- The really good thing about all of the products at MyColourGlass is the fact that we precision cut, or match to your project, if so desired. Of course we offer standard cuts and panels, but then again we can usually do about any project when it comes to toughened glass. Our products and worktops are definitely Bespoke. Glass worktops are a worthy investment, whether it is for your home, or business environment. All products, and orders from MyColourGlass are tailored to the individual needs and desires of our customers, including our excellent glass worktops. Coloured Kitchen Glass Worktops adds some visual interest to your home. For your kitchen or bathroom, glass is a great choice for your worktop. By choosing us to produce your worktop, we can manufacture the perfect pairing to an existing splashback or wall, or we can produce both the worktop and splashback for you, creating cohesive colour palette in your room. Glass doesn’t look out of place anywhere in your kitchen or bathroom, giving you a modern look without showing the age that stone worktops can. All edges are polished. With a variety of thicknesses available (10, 12, 15 and 19mm), you can pick the durability level appropriate for the amount of use. Our glass is toughened as well, and will stand up to years of use. Glass has other advantages, such as being easy to clean, stain-resistant, moisture-resistant and heat-resistant. Being able to hold up to temperatures of up to 400 degrees Celsius means that you can put hot dishes, heated hair styling tools, and more on the surface without having to worry about damage. If you have existing or new hobs, sinks, and pipes, we can cut the glass worktop to any size and shape, and cut allowances for any of the above. After the cut, we polish the edges and paint it in a colour of your choosing. Choose from thousands of colours to find the perfect shade that complements your room. Alternatively, you can send us a swatch of something you would like matched. Once coloured, the glass is completely opaque, so if you are fitting it on top of an existing pattern, you won’t be able to see through it. 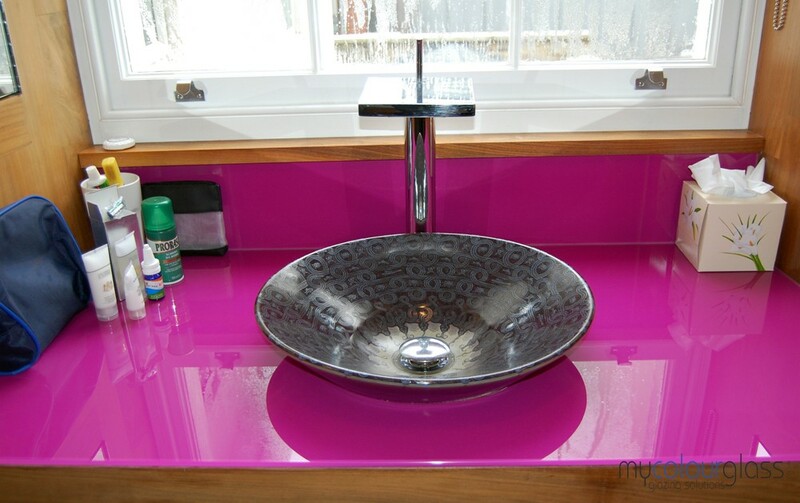 Once complete, your coloured glass worktop can be fitted and installed. Our glass worktops are easy to install in your home, whether you are doing it on your own, with a contractor, or using our services. Only requiring adhesive and a steady hand, the coloured glass worktop can be installed to instantly brighten up a room. When you choose MyColourGlass for your next renovation project, you can be assured that you’re receiving the best. We use only the highest quality of products in our installations, and pride ourselves on our workmanship and attention to detail. All of our glass is also compliant with safety regulations. We promise that you will be completely satisfied once your project is complete.